Dr. Jeffrey Phillips & Dr. Susan Phillips take the time to explain the results of your eye exam, describe your options and listen to your eye care needs. Because maintaining good eye health is an ongoing partnership, we encourage you to ask questions and share your health information, which could be vital to monitoring, diagnosing and treating potential vision problems. 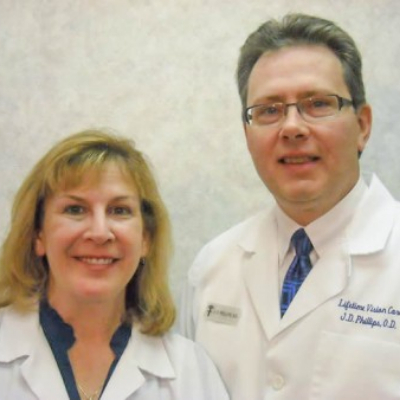 Jeffrey and Susan Phillips have been practicing Optometric Physicians in Pinellas County, Florida for over 25 years. Licensed and Certified to use ophthalmic pharmaceuticals, we diagnose and treat eye infections, injuries and diseases, including glaucoma. Our diagnostic skills allow us to evaluate patients for medical disorders such as diabetic retinopathy, macular degeneration, and optic nerve and vascular diseases. We also specialize in contact lenses and prescription eyeglasses that fit your lifestyle. Both of our doctors have over 25 years of contact lens knowledge to help you succeed. There is a difference among eye care providers. We provide comprehensive eye examination and medical diagnostic services. Unlike an optical Supermarket where you may feel like “just another number,” we are interested in communicating with you, listening to you, and responding to your personal needs. Doctors Jeffrey and Susan Phillips have developed a specialized approach to visual care for residents of skilled nursing facilities and are comfortable working with patients who may have Alzheimer’s disease, brain dysfunction, dementia or injury that prevents them from giving verbal responses (including neonatal and pediatric cases). We have met the eye care needs of skilled nursing facilities around the Tampa Bay area since 1995, for such facilities as Sabal Palms, Palm Gardens, Manor Care, and many others. Each examination we perform is complex and unique…because each patient is unique.